The commentary is based on the following article. 2006 was the "radicalization year" within the Palestinian society which elected Hamas to lead their affairs through a new government after the long traditional dominance of Fatah. The elections' results reflects an ongoing radicalization process which was transparent in the election process. The surprise of Hamas' victory was translated in the public domain to a more motivated and radicalized public atmosphare. Some motivations were focused and pointed internally to the struggle between the Palestinian organizations, mainly Fatah and Hamas, on the dominance over governmental positions and struggle of power over constructing the newly elected Palestinian Government . Within the internal conflict, some of the violence was targeted by Hamas and Fatah to the external common enemy - Israel - as part of the internal struggle of dominance, parallel to their ongoing terror agenda ideology and acts with the increasing worrying direct active involvement of Iran and Hizballah. Analyzing the data indicates the Israeli security efforts and success in a pro-active approach led to the arrest and detainment of potential future terrorist attacks and their supportive infrastructure. Yet, it demonstrates that the motivation within circles of Palestinians who are committed, motivated and recruited to terrorist organizations is still very high. On the other side, Israeli security forces were able to thwart the organizational and operational capabilities of terrorist activities. Still, these numbers demonstrate the ongoing high motivation of parts of the Palestinian society to carry on with terrorism and violence. 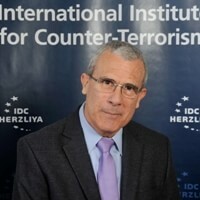 The high level of Israeli intelligence that led to these arrests and prosecutions, is the most influential direct factor to explain the raised number of prosecutions and administrative injunctions.